The Richmond catchment comprises a variety of landscapes from world heritage rainforests to rich agricultural valleys and coastal estuaries. In the north of the catchment lie the Border Ranges National Park and other reserves associated with the World Heritage listed Tweed volcanic caldera and its associated Gondwana rainforests. The Richmond catchment is in far north NSW. The Richmond River begins at the NSW-Queensland border and flows south-east for around 170 kilometres to the ocean at Ballina. The coastal extent of the catchment reaches from Evans Head in the south, to just south of Cape Byron in the north. The Richmond catchment drains an area of over 7,000 square kilometres from the Border Ranges in the north to the Richmond Range in the west and south. The upland ranges and the plateau north of Lismore remain mostly forested while the lower coastal plains are cleared for agriculture. Elevations range from over 1,000 metres in the Border Ranges to near sea level on the coastal floodplain. The catchment includes popular tourist destinations such as Ballina, and supports a high residential population attracted by the region's coastal lifestyle. Lismore and Ballina are the largest urban centres in the catchment. Other towns include Casino, Lennox Head, Alstonville, and the smaller centres of Coraki, Evans Head and Kyogle. 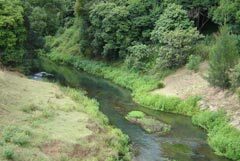 The Richmond River rises in the Border Ranges National Park and flows south through an extensive coastal floodplain to Ballina, where it enters the Pacific Ocean. The main tributary of the Richmond River is the Wilsons River, which contributes around 60% of the flows in the lower river. The Wilsons River enters the Richmond on the coastal plain at Coraki. 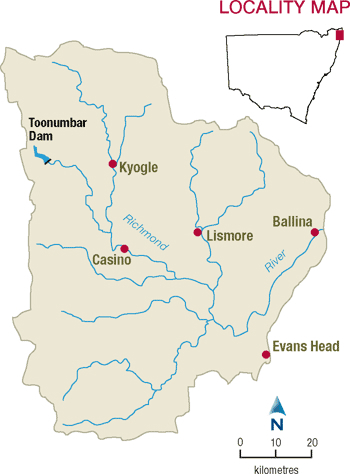 Other important tributaries are Eden Creek west of Kyogle, and Shannon Brook and Bungwalbin Creek, which drain the southern part of the catchment and enter the tidal reach of the river. The Richmond has an extensive tidal zone which extends beyond Tatham on the Richmond River and Lismore on the Wilsons River. The small coastal catchment of the Evans River is connected to the Richmond River at Woodburn by a canal. This canal is operated to mitigate flooding and improve drainage in the mid-Richmond River area. The Evans River flows for around 20 kilometres and enters the ocean at Evans Head. View real-time data from the Richmond catchment on this website. A small section of the Richmond River is regulated by Toonumbar Dam on Iron Pot Creek, which is part of Eden Creek catchment. It stores water from a 98 square kilometres catchment for irrigation, stock, domestic, and town water supplies. Two other storages in the Wilsons River catchment – Rocky Creek Dam and Emigrant Creek Dam – are operated by Rous Water to provide town water for Lismore and Ballina. The Richmond catchment supports a diverse range of land use, including livestock grazing (dairy and beef), horticulture, dryland agriculture (including sugar cane), forestry, and irrigated agriculture. On the Alstonville Plateau, a significant horticultural industry uses groundwater to irrigate fruit and nut crops. Dairy farms on irrigated pastures are found along the alluvial flats of the Richmond and Wilson Rivers. Rous Water is a major water user, extracting water to supply the urban centres of Ballina, Lismore and Lennox Head. Due to a high density of rural settlement, the region's rivers and estuaries tend to be affected by changed run-off conditions caused by land clearing, agricultural use, urban development and recreation. Many streams on the coastal floodplain have been straightened and channelised affecting natural habitat values. Toonumbar Dam supplies water to a small number of users along the Richmond River. However, most of the rivers and creeks within the catchment are unregulated, and pressure from extraction can occur in times of low flow. Water sharing plans have been introduced to balance the needs of water users and the environment. Around 800 square kilometres of the Richmond catchment is protected within national parks and reserves, much of this being in the Border Ranges in the north. Three of these parks – Border Ranges, Toonumbar and Nightcap – form part of the Gondwana Rainforests of Australia World Heritage Area, as well as part of the geologically significant Tweed Caldera (an ancient volcano centred on Mount Warning). The lower Richmond River supports some extensive wetland complexes. The largest of these are Tuckean Swamp on the Richmond floodplain and Ballina Nature Reserve which protects extensive areas of mangroves and saltmarsh communities. The Big Scrub is a lowland rainforest community that once covered approximately 75,000 hectares of the Richmond catchment. Now endangered, less than one per cent of this ecological community remains. The small remnants constitute one of the most diverse ecosystems in NSW supporting more than 300 plant species and an equally diverse fauna population.